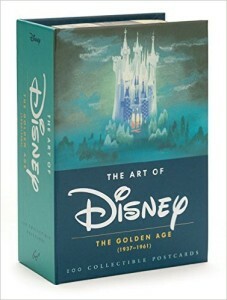 The Art of Disney: The Golden Age (1937-1961) is box of postcard collection that features the final frames from Disney’s golden age of animation some of which include Snow White and the Seven Dwarfs, Pinocchio, Fantasia, Dumbo, Bambi, Cinderella, Alice in Wonderland, Peter Pan, Sleeping Beauty, and One Hundred and One Dalmatians. Aside from the address lines and the space for the stamp, the top left corner of each post card contains information regarding the movie it displays like concept art, story sketch, and clean up animation drawing. The post card also indicates the artists who were involved in drawing the sketches and the medium used to color or modify them. In addition to featuring scenes from famous Disney films, there are also post cards that showcase images from minor films like The Band Concert, Hawaiian Holiday, Boat Builders, Art of Skiing, Donald’s Camera, Nifty Nineties, Three Caballeros, Canine Casanova, and Cat Nap Pluto. Looking at the quality of the post cards, they are made with thick, glossy material that are sure to make the post cards last for quite some time. Some readers may find the post cards dull and not that interesting since most feature sketches of the earlier Disney film. Others may also think that the title suggests a book and not a collection of post cards. As for those who have already bought the product, some of them think that their money is not worth the it.